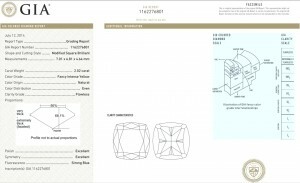 At AIDC Advantage Corp., we only deal with GIA certified diamonds. At the GIA, highly skilled graders working in tightly controlled viewing and lighting environments compare each diamond to a standard set of color comparators in order to consistently determine the diamond’s characteristic color and assign a color grade. GIA’s colored diamond color grading is based on the presence of color. GIA describes color in terms of hue (the color), tone (relative lightness or darkness), and saturation (intensity). Hue (like pink) is modified by a “Fancy-grade” term (Fancy Light, Fancy, Fancy Intense, Fancy Deep, Fancy Vivid or Fancy Dark) which describes the effect of both tone and saturation.